Been watching "The Great Wall" yesterday and thought I should start discussion about your favourite movies. Share your favorite ones and let us know why they became your favorite ones? What is your favorite genre? If you plan to share links, make sure it is IMDB or Wikipedia. If it is a trailer - official trailer's Youtube link. I am a big move maniac to be honest, like various movie genres, from comedies to dramas to horror and so on, as long as I enjoy them. Old boy - Mystery thriller, which is superbly dark and has an insane shocking moments in it, I always remember 2 of them, which are mind-blowing. I saw the Devil - Another psychological type of thriller, it got me thinking of how I would have reacted and what would have I done if something like that happened to me. Cold Fish - This one is a specific mention from me, as it is one of the darkest and "deep" movies I've seen, not only with it physical brutality, but the psychological effect and thoughts it leaves after. There is so much more of them, but it would be a big list to share and I will definitely post couple more a bit later. Public Enemies - another "gangsta" movie with Johnny Depp. Fury - a movie for people who are interested in "war" topic and a bit of history. Excluding couple facts of Star Wars elements, the movie was amazing and depicted that time in a very high detail, not even talking about accuracy, since the whole movie gave special attention to War Veterans, specifically from Tank Squads. Tears of The Sun - another War type of film with Bruce Willis, which was very memorable due to what happened in the movie and how dramatical it was. Horror movies are probably my most favorite genre (Don't mix it with horror comedies) and I've seen most of them, and when I say most of them, I actually mean it. It all began with "The Exorcist", "Tremors" and "Other" (which is actually a mystery drama)(I was 6 at that time, when I saw Exorcist and it got me scared real bad lol) until "Don't hang up", "Train to Busan", "The girl with all gifts" and I could continue.. Some of them are not even scary or even surprisingly stupid. It is a genre which always gets my attention, not even sure why. Last edited by AzureSensei; 24-03-17 at 10:56 PM. Re: [Film Discussion] Your favorite and most memorable movies? Just finished watching Kong: Skull Island and I can say: OH MY GOSH! That was epic! 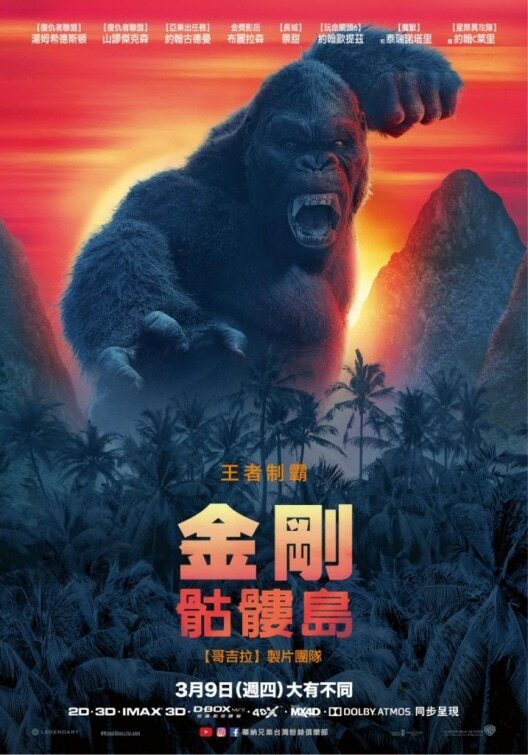 I remember when I watched old Kong's and they where amazing, as I was very young then, but this movie brought back that feeling. Not only effects where mind blowing, but the acting was spectacular.. Highly recommend this movie! no film can even come close. Saw Dunkirk last week. My god what an experience. The movie is definitely not for everyone and don't go in expecting epic battle scenes, fighting etc. It's an emotional movie with very little dialogue but my god is it intense. Christopher Nolan + Zimmer is a magical combination. Zero Days is the most acknowledgable documentation movie I've ever seen (and in my opinion one of the most important movies ever made). Stuxnet was malware that flashed around the world via Microsoft computers, triggering arbitrary BSODs and random reboots. In 2010 cybersecurity firms captured and began analyzing the worm. Stuxnet (name derived from merging two random lines in the code) had digital certificates. Digital certificates require biometrics (human identification) and pass codes. But Stuxnet could attain access without that. It ominously coded multiple zero days exploit. Symantec's investigators see maybe one a year, looking at thousands of lines of code. Stuxnet had four. As we learn in the documentary, it also had undoubtedly stolen product identity codes for PLCs (programmable logic controls) from Siemens. Where were these PLCs? Installed on centrifuges at Natanz, an Iranian nuclear site. And the game's afoot. Whose program? To what purpose? Gibney does an excellent job of gearing us up for the technowizardry with hunter/seekers Eric Chien and Liam O'Munchu (Symantec) as geek guides to the nation-state business of cyber espionage and, as General Michael Hayden, former CIA and NSA director calls it, the "hideously classified" world of cyber weaponry. We meet the journalists, bench players and sideline government officialdom who were not a part of, or even aware of, Stuxnet. The documentary is a mild, entertaining but serious call to start a dialogue about cyber weapons and deployment of same. How do countries begin to arbitrate treaties regarding use of life-threatening coding? Filmed well, the effects shrouding the unnamed informant are great viewing. The on-camera personnel are well-chosen, entertaining and as informative as they're able to be. There are enough tech buzzwords to keep nontechs like me interested, and enough about how dangerous coding with a mission to DISRUPT DEGRADE DESTROY can be for those of us who count on critical infrastructure systems. The Legend of 1900, Hacksaw Ridge and The Shawshank Redemption are both in my top movies list for storytelling (amongst others), alongside The Martian and The Bourne Trilogy as just favourites to relax with (Matt Damon movies are great, except The Great Wall which was pretty average). I have recently watched Adrift (2018) and without a doubt it has become one of my favourite ones. But keep in mind thay if you are depressed, just ignore my recommendation and go and see another movie, cause it is a sad story. Having said that, it is an excellent movie and the acting is top notch. BlareRunner 2049 + original Blared Runner - just...epic. Watched 4 times already.